On Saturday, November 3rd, just one day after competing in the East Coast Conference Championship in Rochester, NY and making the six-and-a-half hour return trip to the nation’s capital, the University of the District of Columbia women’s cross country and Indoor and Outdoor Track & Field team volunteered at the National Race to End Women’s Cancer 5K hosted by the Foundation for Women’s Cancer. 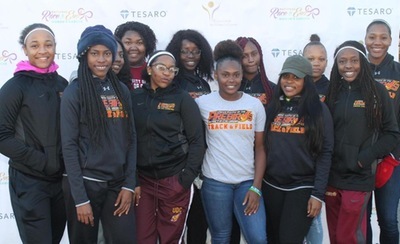 The group of 12 student-athletes and head coach Joel Phillip assisted with race registration and t-shirt pickup, handing out pre and post-race snacks, as well as providing energy and encouragement for the race participants. The race started more than nine years ago as a pinnacle fundraising and awareness event for the Foundation for Women’s Cancer. It serves as an opportunity to bring families and friends together to support women with gynecologic cancers. Today, more than $1,100,000 from the race has been raised with more than 20,000 participants from survivors, advocates and families attending the race and donating from across the country. “We were so excited to be a part of such a great event,” Phillip said. “Some of us have family members who have battled, or are currently battling, this horrible disease. Just being able to be a part of and help at this event gives us a sense of gratification as we are helping spread awareness and education about this disease. “This event also aids in raising money for research in the fight to end women’s cancer, which we are grateful we got the chance to be a part of. We had tons of fun and we are looking forward to volunteering at next year’s event,” Phillip said.